I've owned this 1986 dlx 4wd wagon for about 6 months, its time to fix her up. It was burning coolant and ran a bit hot. The last owner suspected a cracked head, so I picked up a spare engine from forum member waynehoc. Last edited by LowBuckCanuck on Mon May 07, 2018 10:04 am, edited 1 time in total. The new head, all clean from the parts washer. The head is out of Jenny. Looks like one of the previous owners was a reader of the forum, the headgasket had the petros holes drilled in it and the nicks around the spark plug. There is nothing obtusely wrong with either the head or the headgasket, so I have a bit of a dilemma. Should I just replace the headgasket, of the full head as I originally planned? I don't know for a fact if the head is cracked, but I'm pretty sure the last owner said he had it pressure tested, with results suggesting a cracked head. it does not cost much to have the head tested in an auto machine shop, best to have it done rather than waste an effort. That being said, I would find it hard to believe you have a toyota head that is actually cracked. I have really abused and over heated 3ac heads, to point it was warped so bad it needed the cam shaft line bored, and rebuilt a wrecking yard engine that the piston was banging against the head because bearing was beat out. and I have never found a crack, it was always the head gasket. It is possible, it just seems like a really rare occurrence. almost in every case I have heard about it, it was the head gasket. That being said, I still think I'll change the head. Waynehoc said it ran fine on the hatchback it came out of 12 years or so years ago, besides a rod knock. Everything I need is right in front of me, so I might as well. Once I clean up the head from Jenny I can inspect it, and use it as a spare if need be. I also changed out the broken antenna for a whippy cb radio antenna I slightly modified. It looks good, is much more durable, and best of all, picks up 92.5 stoke fm in excellent audio quality. with a whole spare, it might be worth doing a whole rebuild on the head, new exhaust valves (highly recommended), guides if necessary, new valve stem seals, resurface gasket face, general clean up, etc. new exhaust valves and valve stem seals are not costly and well worth installing now, you likely will have to pull the head off in the coming year or so for these reasons so you might as well install those now on your replacement head. I would not trust a 35 years old head just because it "ran fine" 12 years ago. valve seals get hard and dry up when the car sits for a long time. new valve stem seals are only about $8.00, new exhuast valves are about $30. When the factory spark timing is used it makes the exhaust run hot (for emissions reasons), and it will cause heat fatuge and heat damage to the exhaust valves, even if they look fine, you risk having all or part of the valve head break off and do a lot of internal damage to the engine. you risk not just damaging the head, but also the block and crank shaft (I have seen bent connecting rods, bent crank, and severely damage head and piston when the exhaust valve breaks apart). not worth the risk, install new exhaust valves. The scientific thing to do is replace one thing at a time, so I guess I'll just replace the headgasket and see if the problem persists. A full rebuild of my spare head is on the menu if the leaking continues. On a side note, how often are head gaskets faulty? I can't see anything wrong with the old headgasket, besides the fact that it left a kind of nasty residue on the mating surfaces. 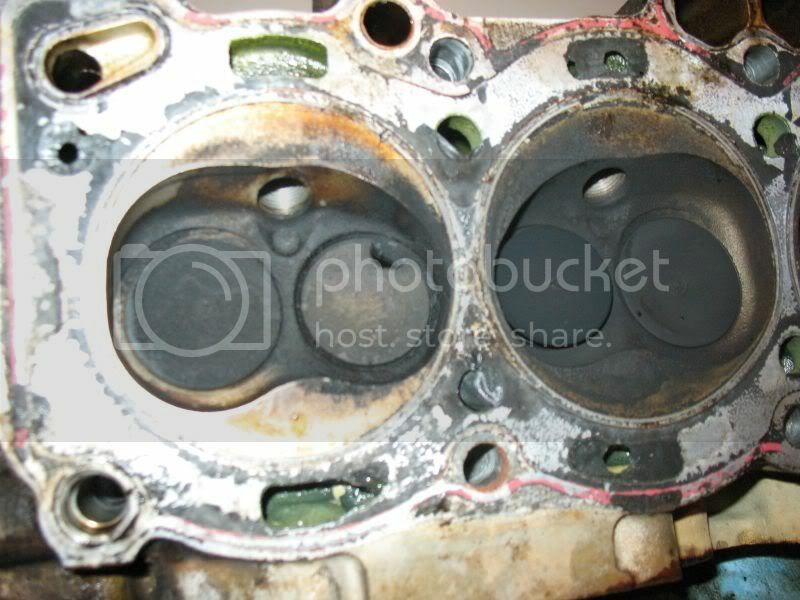 you can not tell by looking at the head gasket that it is leaky. it usually the seal fails between cyl. 1 and 2. but unless you keep driving it until total failure, you really will be hard pressed to see anything wrong with it. I have kept driving a bad head gasket for many months by adding water to the radiator every few days, eventually the whole section of of the gasket blew out between cyl. one and two. It would hardly run on just the rear two cylinders. If the gasket is installed carefully and properly, and you NEVER allow it to over heat (that means keeping all the hoses good and replacing the water pump and thermostat BEFORE they can fail), keeping the radiator clean, etc. it can last well over 100k miles, even 200k is not uncommon. Abuse it and it will last only a few months. I have found they do not tolerate higher temperatures before they become compromised. Please, at least replace the exhaust valves. They can only be replaced when the head is off. They do not cost very much. the valve stem seals can be replaced without pulling the head off, but that is not true of the valves. If you do not replace the exhaust valves you run the very high risk of loosing an exhaust valve, and at worst, wrecking the whole engine. here is what happens when you reuse exhaust valves, this piece broke off without damage, but the head had to come off to fix it anyway since that cylinder was producing no power. This exhaust valve had less than 200,000 miles on it. they can also break off into the cylinder, getting crushed into the piston top, causing catastrophic failure of the engine. In this case I got lucky and the piece went out the exhaust, but I have seen a number of 3ac engines that were not so lucky. Replace those exhaust valves. For reference the car has 180000 kms on it, or about 120000 miles. Everything is back together... just needs spark plugs, coolant, and oil. Ok, I need some help. Everything is back together, and Jenny starts, except it starts TOO well. The engine starts revving uncontrollably, and I have to shut the ignition off to prevent damage. The throttle isn't sticking, and I don't think I messed with the distributor. That leads me to believe it is a vacuum leak, but which hose would do this? Thanks in advance. I figured out the problem, it was a stray vacuum hose between 2 diaphragms. Now my problem is that it won't idle, you need to pump the throttle to start it and keep it running. Also, it seems rev happy; I suppose the throttle response could best be described as jerky.